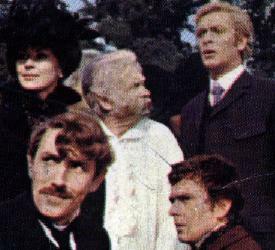 John Mills, Ralph Richardson, Michael Caine, Peter Cook, Dudley Moore, Nanette Newman, Tony Hancock, Peter Sellars all appear in the Salamander production The Wrong Box. Larry Gelbart and Burt Shevelove wrote the screenplay and co-produced with Bryan Forbes who also directs. It's a damn cheek including this book on this site for all sorts of reasons, of which the two chief are perhaps that (1) it's more than half-a-century older than anything else here, and (2) Robert Louis Stevenson is one of the true masters of English story-telling. My excuses are that (1) it was filmed in 1966 as a kind of tribute to modern British comedy, and (2) it's brilliant and undeservedly neglected. Written in 1889 by Stevenson and his son-in-law Lloyd Osbourne, The Wrong Box is based on the tontine system. This is a curious financial arrangement whereby a large number of subscribers all contribute a stake to a central trust fund, and collect an annuity from it. Gradually, as members of the tontine die, those who remain find their annuity increasing; when all but one are dead, the survivor collects the entire pot. This bizarre concept was initiated by Lorenzo Tonti, a 17th century banker, and proved quite popular in the 18th century. By late-Victorian times, it was virtually unknown, but Stevenson & Osbourne's tale concerns one of the last examples of the type, in which 37 young boys had each had £1000 placed in the fund; by the time we join the story, there are just two left - a pair of elderly, squabbling brothers, whose closest relatives are in a state of perpetual feud as the maturation of the by-now enormous pot of money approaches. This is the backdrop. The story itself is much wilder, with a succession of characters desperately trying to offload a corpse on each other, and is written in a style of high black comedy that nods over the Atlantic towards Mark Twain but also points forward to Joe Orton. It could have been this fact that prompted director Bryan Forbes to recruit the cream of British comedy talent to make a movie version of the piece, amongst them Tony Hancock in his last big screen role, Peter Sellers, Peter Cook & Dudley Moore. The film's dated but has its moments; the book is fantastically readable and hugely entertaining.